I loved the original Ghost Ghost EDT - I had a couple of bottles just after its release back in 1999/2000 - the mix of jasmine with rose petals blended with vanilla, sandalwood, hibiscus with a hint of musk was really quite gorgeous...in fact reminiscing I feel I must visit a perfume counter and revisit this scent! 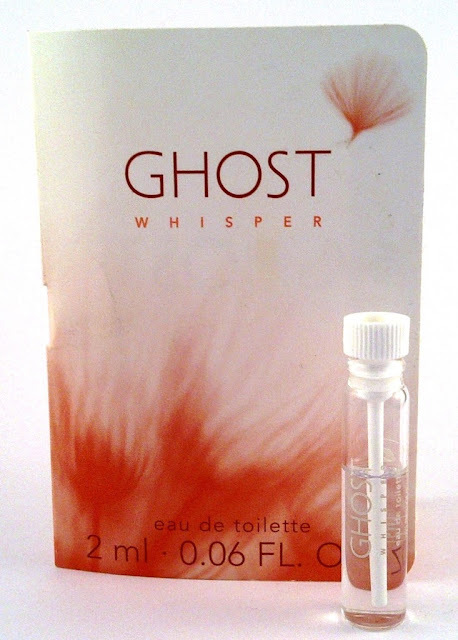 Looking into my box of perfume samples I came across Ghost Whisper EDT, strangely I must have missed the release of this as I don't remember it at all, curious I decided that this was the next perfume fragrance to come out of the box. This is really quite nice. Not overly fruity, slightly sweet and most definitely feminine. This is an attractive scent that is rather comforting in a familiar way. I feel like I have had something similar in the past but cannot quite place it. A great blend of ingredients, pleasant for Spring.